Australia vs Pakistan 2nd test 2018 of Australia and Pakistan in UAE Series being played Sheikh Zayed Stadium Abu Dhawi from 16 Oct to 20 Oct 2018. 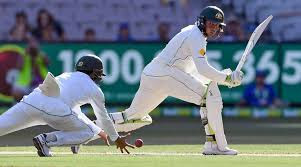 Hi friends, I'm Gyan Ranjan, In this blog post, you will get, live cricket score, live updates, description of special moments and Australia vs Pakistan 2nd test highlight. After 1st test draw both teams are in search of a 1st win. Pakistan did some changes for this match. Fakhar Zaman, Mohammad Hafeez, Azhar Ali, Asad Safiq, Haris Sohail, Babar Azam,Sarfraz Ahmad(c & wk), Yasir Shah, Bilal Asif, Mir Hamza, Mohammad Abbas. Fakhar Zaman and Sarfraz Ahmad played the amazing inning of 94 each. Fakhar Zaman scored his 94 with the help of 8 4s and 1 6s. Sarfraz Ahmad smashed 7 boundaries for his 94. Yasi Shah 28, Azhar Ali 15 and Bilal Asif contributed with 12 runs. Other batsmen of Pakistan couldn't do the good performance for the team. Nathon Lyon got maximum of 4 wickets in this match. Marnus Labuschagne 3, Mitchell Starc 2 and Mitchell Marsh got 1 wicket for Australia. Pakistan could score 282/10 in 81 overs. Australia was in the problem from the beginning of his inning. Australia lost their wickets at regular intervals. Only Aron Finch could score 39 runs. Trevis Head 14 and Mitchell Marsh contributed with 13 runs. Mitchell Starc played an inning of 34 runs. Pakistani bowlers didn't give permission to build the inning. Mohammad Abbas got a maximum of 5 wickets in this match. Yasir Shah 1, and Bilal Asif also did great bowling. He got 3 Australian wickets. Marnus Labuschagne lost his wicket as a result of run-out. He scored 25 runs. Australia scored 145/10 in 50.4 overs. This was Australia vs Pakistan 2nd test highlight of the first inning. Fakhar Zaman played an amazing inning of 66 with 7 boundaries. He lost his wicket c&b by Lyon. Azhar Ali 54* and Sohail 18* still on the crease. Pakistan scored 144/2 in the 2nd inning of Australia vs Pakistan 2nd test. Pakistan declared at the score 400/9. Azhar Ali 64, Asad Shafiq 44, Sarfraz Ahmad 81, and Babar Azam played an amazing inning of 99 runs. He smashed 6 boundaries and 3 sixes for his 99 runs. Nathan Lyon 4, Labuschagne 2, Mitchell Starc and Mitchell Marsh got the 1-1 wicket. Australia lost his 1st wicket at the score 10. That was the wicket of Shaun Marsh. He could score only 4 runs. Mir Hamza bold him. Aron Finch 24* Travis Head 17* still at the crease. Australia scored 47/1 in his 2nd inning. Australia needs 491 runs. Australia lost all the wickets at 164 and lost the match by a big difference 373 runs.